In order to grow, mold needs food, moisture, and a dark place to set up shop. Few places in your home check off quite as many of those boxes as a crawl space. Being underneath the house, a crawl space is darker than many accessible places in your home, and dirt floors and wooden structural supports provide an ample supply of organic material for mold to consume. Just add moisture, and the conditions are prime for a mold problem to arise in your crawl space. Once there is a mold problem down there, it is only a matter of time before the issue begins to spread into your home itself. Musty Smells – Many varieties of mold emit a musty odor that is often detectable before more serious risks come into play. Think of the smell you get from mildew, itself a type of mold. 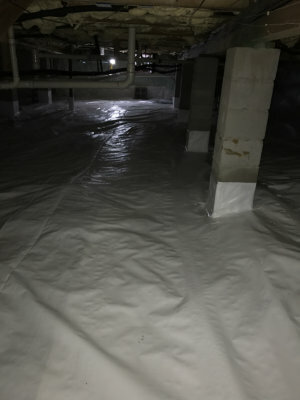 If you are noticing this odor and cannot seem to place where it is coming from, (or have a tough time eliminating it) consider looking into the possibility of crawlspace mold being the culprit. Extensive Allergy Symptoms – It is no secret that exposure to mold spores can trigger allergic reactions. The longer the exposure continues, the worse the reactions become, as your immune system tires out from the constant battle with the spores attempting to invade your body. Allergic reactions to mold exposure can range from things like coughing or eye irritation on the more mild end, all the way to diseases or lung obstructions at the most serious. High Utility Bills – A lot of times, mold issues will go hand in hand with an otherwise unexplained spike in a home’s utility bills. If you notice that your utility bill is suddenly experiencing a surge that you can’t explain, consider doing some investigation. The issue could be stemming from a leak in the water or air conditioning systems, which could create the type of moisture that leads mold problems to form. Even if you never interact with the crawlspace of your home, you aren’t necessarily safe from the effects of mold growing down there. As air beneath your home warms, it will begin to rise and carry with it any spores that have accumulated with it. From there, all it takes is any kind of minor fault or flaw in the structure of the house for the mold spores to have easy entry into your life. As with many mold prevention projects, there are a couple of options to consider, both of which will do their own part to help minimize the opportunity for mold to invade and set up shop by controlling moisture buildup in the crawl space. 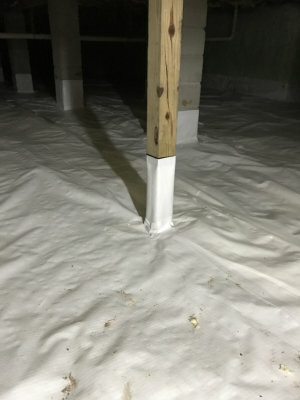 Encapsulation – One great way to eliminate the buildup of moisture in your crawl space is to encapsulate the crawl space itself. Essentially, you will want to use plastic sheeting to line the walls, floors, and entrances to the crawl space. Your goal is to physically block out the moisture wherever it may try to enter the crawlspace, be it through a doorway or up through the dirt below. Dehumidification – Another approach to consider in order to prevent an accumulation of moisture in your crawl space is to actively monitor and control the humidity levels yourself. Use a barometer to allow you to see the humidity level in the space and then use a dehumidifier to keep the overall moisture at an acceptable level. You want to aim for below 70% humidity, while also taking care to not remove too much moisture from the area, as that can lead to other structural issues in the flooring of the home. In conclusion, the above tips can be used to help minimize the possibility of crawl space mold causing problems in your life, but take care when pursuing preventative measures. The crawl space can house many dangers to anyone coming in to poke around, from mold spores to dips or faults in the ground to pests that have moved in. Any of these have the potential to cause you injury or worse if you are not careful in your work. As always, if you run into anything you are unsure of or have questions about, our best advice is to contact a local mold professional who can take a look and offer an expert’s opinion on how best to proceed.